North Jersey residents and businesses may not realize that asphalt cracking can allow water to permeate the asphalt and erode it. Pools of water that cannot properly drain can ruin your asphalt, so using an asphalt company that has the ability to prepare the base properly, level the surface correctly, and ensure adequate drainage will help ensure that your asphalt is long-lasting. Family-owned Paving Plus, in Bergen County, has been providing customers with exceptional asphalt paving for more than 30 years. If you’re planning on excavating your backyard or adding a new driveway or parking lot, you’ll need to make sure that the area properly drains so water doesn’t damage your asphalt or concrete project. Get a free estimate from Frank A. Macchione – Paving Plus. We’re your local Bergen County excavation and drainage experts. Give us a call at 201-652-0694 for a free estimate or fill out our contact form. We’ll give you a cost estimate within 24-48 hours. Frank A. Macchione, owner of Paving Plus, has a team of experienced, insured asphalt specialists that include family members. Frank has a personal interest in the superior workmanship of each project, and his excellent reputation is based on the satisfaction of clients over time. Contractors at Paving Plus anticipate drainage issues and make plans to avoid them. After creating a plan, it is important to prepare the base. Soil will be carefully compacted, and the area will be leveled. Paving Plus focuses on making sure that the prepped surface provides a structurally sound foundation for the asphalt. 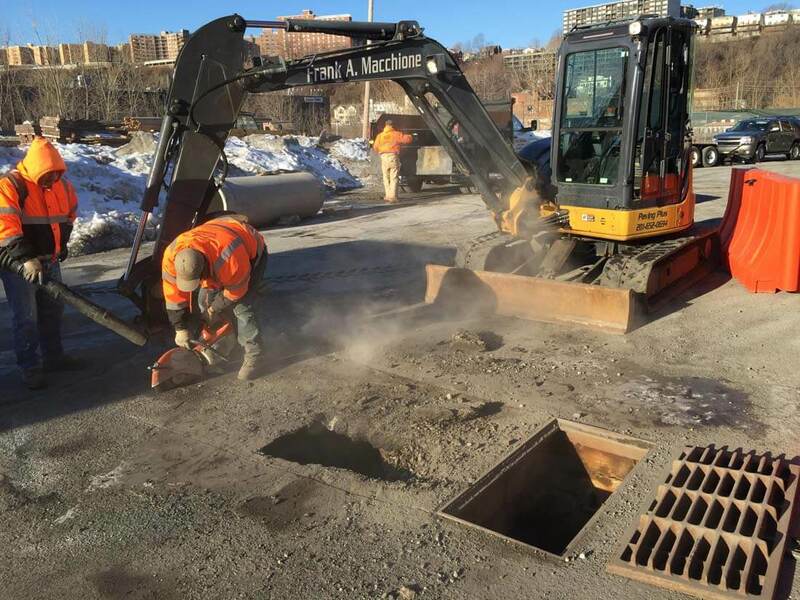 In addition to ensuring that new asphalt has a stable foundation that makes drainage problems unlikely, Paving Plus can also correct drainage problems that occur in old asphalt. Our specialists can inspect your existing surface and make recommendations to help improve the condition of your asphalt. The condition of your asphalt will influence pricing. Whether you are seeking to replace eroded asphalt, correct drainage problems, or contract a new asphalt project, Paving Plus has the expertise and professionalism to provide quality work. Please call our office at 201-652-0694, or complete our online form to receive a quote.